Marine plastic pollution is a new global challenge influencing environmental health, the maritime economy and carbon cycling. Biofilm found on marine plastic implies that a new ecological niche has formed, referred to as the Plastisphere. In this project, we study biogeochemical cycling associated with this marine plastic debris. Our focus is to understand the microbe-plastic interface to expand our knowledge about how marine plastic and microorganisms interact over spatial and temporal scales in marine waters and sediment. Together with our collaborators at Aarhus University, Stockholm University, UFZ Helmholtz Centre for Environmental Research, and the Mads Clausen Institute – SDU – NanoSyd, we explore how microbes degrade, transport and incorporate (micro)plastic into biogeochemical cycles via microbial community studies, biofilm imaging, and element analysis. This project is funded by the VILLUM FONDEN Young Investigator Programme. Anoxygenic phototrophic bacteria are considered one of the earliest evolved organisms on Earth because of their phylogenic antiquity and their ability to metabolize iron and sulfur using light energy. Iron and sulfur were abundant on early Earth, so their oxidation states and isotopic signatures in the rock record may be used to understand the rise of oxygen on Earth. Anoxygenic phototrophs likely dominated aquatic environments for billions of years on ancient Earth before our planet transitioned from oxygen-poor to oxygen-rich. I wish to understand the role of anoxygenic phototrophs in the carbon cycle today to better interpret the potential markers of this metabolism in ancient sediment. I have been working at stratified lakes rich in dissolved iron or sulfur and anoxygenic phototrophs. 3 billion years ago aquatic environments such as these covered the Earth, but because dissolved Fe and sulfide will easily oxidize, today´s atmosphere makes these locations rather rare. One such lake is the euxinic Lake Cadagno, Switzerland and another is the ferruginous Lake La Cruz, Spain. Here, I study the carbon isotope ratio in bacterial biomass and determine the isotope fractionation between the particulate organic carbon and dissolved inorganic carbon in the water column, sediment material and sediment. 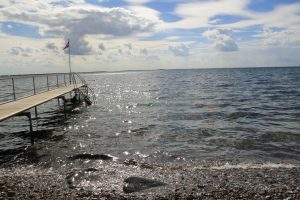 These isotopic values in the environment are compared to pure cultures of anoxygenic phototrophs cultivated from these lakes in order to understand the contribution of each bacterial community member to the bulk isotope ratio. By linking in situ experiments at the lakes to lab experiments with pure strain bacterial isolates, I am exploring the preservation potential of bacterial isotope signatures. This work was carried out at NordCEE-SDU and was funded in part by a DFG Postdoctoral Fellowship [PO-1624/1-1] and a Marie-Curie Individual grant – BioCTrack . 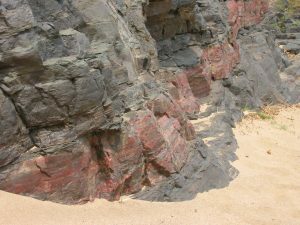 Besides their economic value, banded iron formations (BIFs) are studied as potential archives of the Precambrian environment. The mechanism of their deposition is enigmatic. I have been interested in understanding and constraining the role that microorganisms may have played in BIF deposition. As the Earth was anoxic until the Great Oxidation Event ca 2.45 to 2.32 Ga, the investigation of O2-independent mechanisms for banded iron formation deposition has been extremely relevant to understand the interplay between life and the evolution of the rock record. Over the past years, I have explored the long-standing proposition that Archean banded iron formations may have been formed, and diagenetically modified, by anaerobic microbial metabolisms. To do this, I have carried out isotope, eco-physiological and phylogeny studies, molecular and mineral marker analysis, and sedimentological reconstructions. 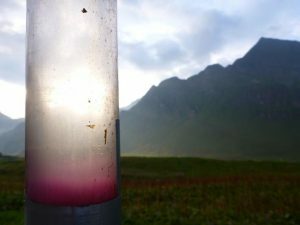 One very exciting experimental result has been the development of a model for BIF deposition which explains the alternating precipitation of the Fe-rich and Si-rich layers via abiotic and biotic processes triggered by temperature changes (Posth et al., Nature Geoscience, 2008). This work was carried out in the Kappler Lab (Uni Tuebingen) and in part funded by a DFG Postdoctoral Fellowship [PO-1624/1-1 and PO-1624/1-2].